Aggreko had the unique opportunity to be part of the Gulf Coast Oil & Gas Conference & Awards Gala yesterday. We started the day off by attending the conference at the Westin Galleria in Houston, Texas. Speakers from Anadarko Petroleum, Candor Energy, Preferred Technology, Breitling Oil & Gas spoke on topics ranging between Midstream to Drilling & Completions to Safety to Environmental Regulations. Prior to our presentation, Texas Railroad Commissioner David J. Porter spoke on regulation and compliance. Advantages to utilizing scalable Microgrids across multi-well sites. 7 Gulf Coast – Market Update: Innovative Power Management in North American Shale Plays from OilandGasAwards on Vimeo. 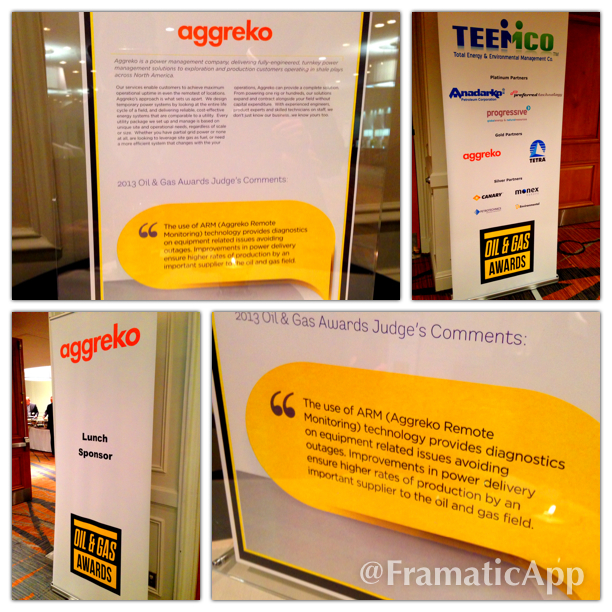 In the evening, Aggreko attended the Awards Gala. Over 400 individuals from the Oil & Gas industry attended the event. Aggreko also participated in handing out the Aggreko Award for Excellence in Environmental Stewardship, which went to Breitling Oil this year. Aggreko was also a finalist for the Industry Supplier of the year Award. Though we didn’t win this year, we are proud of the value we have been able to bring to the industry and our customers. What is the Oil & Gas Awards? The Awards are a platform for the oil and gas industry to demonstrate and celebrate the advances made in the key areas of environmental stewardship, efficiency, innovation, corporate social responsibility and health & safety. To learn more, please visit the Gulf Coast Oil & Gas Awards website.